Jacci Delaney first studied at Southern Illinois Unversity Carbondale and received a Bachelor’s in Fine Arts specializing in glass, a BA in Art history with a minor in museum studies. She then went to work in a glass studio for three years and then went to graduate school at The Ohio State University earing an MFA. She has worked with glass for 16 years developing her skills and glassblowing and glass casting. Jacci has been teaching at the Columbus College or Art & Design since 2015 and has taught such classes as Intro to Glass, Intermediate/Advanced Glass, Visual Literacy II, Drawing 1, and Drawing for Design. 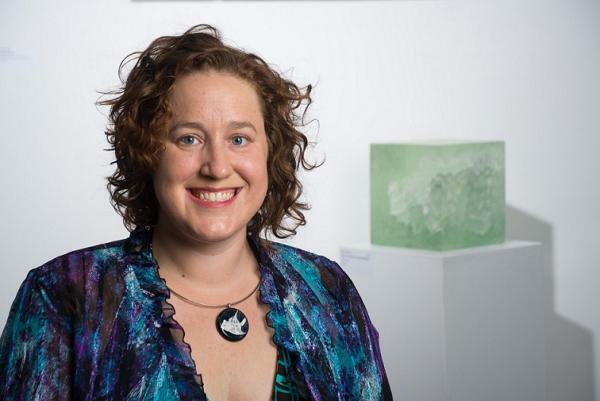 Jacci’s professional recognitions included being selected to show her work in the exhibition “Vetro Illuminato: Illuminated Glass” in Murano, Italy in 2018, having the Space Light Artist Residency and solo exhibition at the Holocenter on Governor’s Island in summer 2017, receiving the Emerging Artist Lecture Award at the Glass Art Socie ty Confe rence in 2015, and having her work in the exhibition International Triennale of Silicate Arts in Kecskemet, Hungary. Learn more about Jacci Delaney online at www.jaccidelaney.com and on instagram #jaccidelaney.